At this time occupied by J. 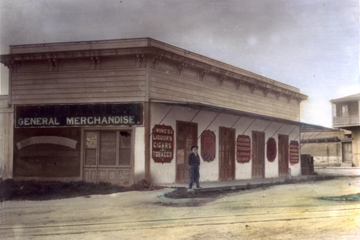 A. Urbanus grocery store and general merchandise. Stevenson was close friend of Simoneau, his wife, Dona Martina and maintained a correspondence with him for the rest of his life. 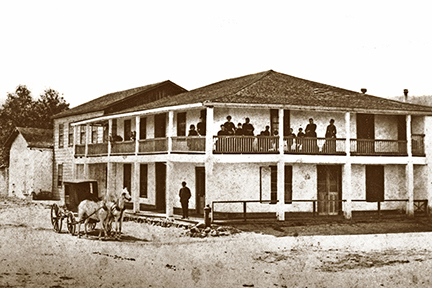 the Lyon's Ale Depot was the hub of Bohemian, a meeting place of Nineteenth-Century Monterey. view from the bridge over Hartnell Gulch. tiny upstairs room and stairway leading to the back yard. 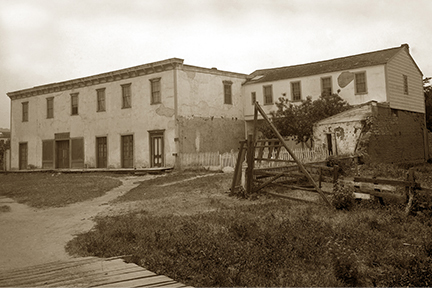 Monterey Pioneer Bakery in the Cooper-Molera Adobe on right. 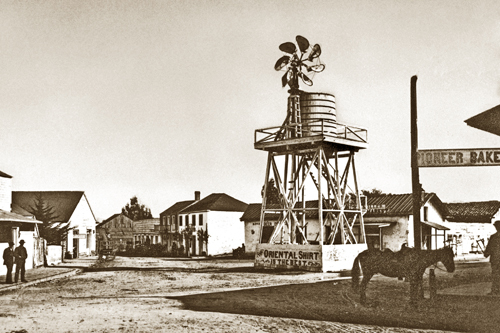 The adobe in back of the Town well and windmill is Jules Simoneau's restaurant and saloon the Lyon's Ale Depot. Stevenson arrived in Monterey by rail on the Monterey and Salinas Valley narrow gauge on August 30Th., 1879. To be with his lady love Fanny Osbourne, and Fanny's children Belle and Lloyd and her sister Nellie Van de Grift Sanchez that she was staying with at the two-story adobe dwelling of the Senorita Maria Ygnacia Bonifacio. In September, RLS went camping out in Carmel Valley. He camped on a 178 acre angora goat ranch on San Clemente Creek. The owners, Jonathan Wright and Ansom Smith, found him lost and wondering in the hills he was weak and sick. They took him in and nursed him back to health for almost a month. Luckily back in Monterey, Manuela Girardins son-in-law was Dr. John P.E. Heintz. Heintz and his wife Marie Clementine took Stevenson in and nursed him when back to good health, at the French Hotel it was operated by them for her father. In his short stay in Monterey he visited the keeper Allen Luce of the Point Pinos Lighthouse in Pacific Grove and the Chinese fishing village at Point Alones. He attended San Carlos Day Mass on November 5Th. 1879 at Mission San Carlos Borromeo (Carmel Mission). an account of this was published in the Monterey Californian on November 11Th. 1879. Some historian suggests the map and settinng of Treasure Island was modeled after Point Lobos, south of Carmel. While in Monterey, Stevenson started a forest fire. He was fascinated by the many fires started in the California forests and wondered whether it was the moss growing in the trees that first caught fire. The moss did catch fire and quickly spread up the tree. The Pavilion on the Links, which he wrote when he was in Monterey. In a letter to Scribner's Magazine, dated November 15, 1879, he states, "I lodge with Dr. Heintz; take my meals with Jules Simoneau" at the Lyon's Ale Depot. 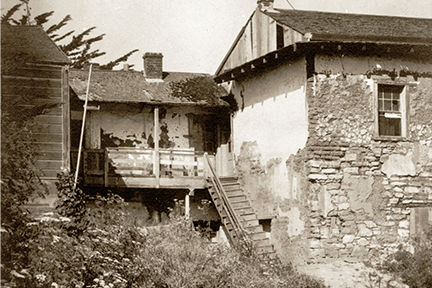 On 22 December 1879 Stevenson left Monterey and moved into lodgings at 608 Bush Street, San Francisco. 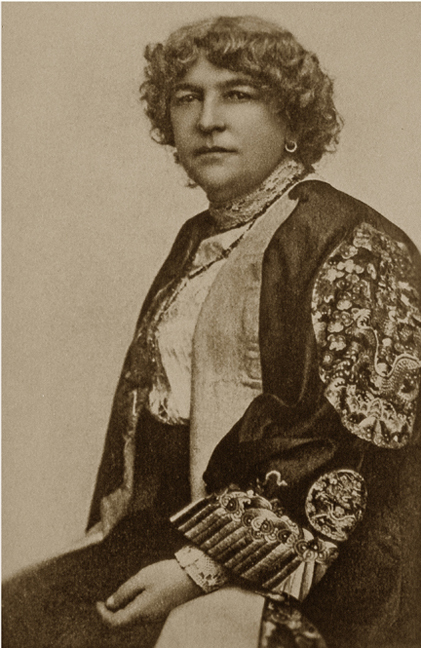 He and Fanny were married on May 19, 1880 in San Francisco. 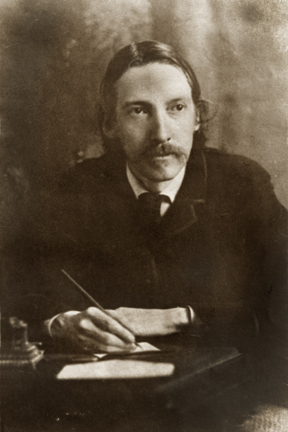 In June of 1888, Stevenson chartered the yacht Casco and set sail with his family from San Francisco bound for the South Pacific. In 1890, they purchased four hundred acres in Upolu, one of the Samoan Islands. Where he died a short four years later on December 3rd, 1894 at the age of 44, at his Plantation known as Vailima. Prints are available in from 11x14" to 40x60"